Graphene Market Size was estimated over USD 20 million in 2016 and the industry will grow by a CAGR of about 35% up to 2024. Graphene is a transparent two-dimensional carbon allotrope which was discovered in 2004. It is a good electrical and thermal conductor and is known to be 200 times stronger than steel. Product properties such as high electron mobility, permeability and heat resistance has led to its growing usage in flexible radio frequency devices, consumer electronics, supercapacitors, sensors, conductive inks, coatings, composites, etc. Since its discovery, the number of research publications on the product has increased from over 125 in 2005 to more than 9000 in 2013. This will augment the graphene market growth from 2016 to 2024 as it will enhance product applicability in various industries. Product versatility and favorable physical properties have resulted in increased R&D in the market to develop more advanced grades. This will help to propel the global graphene market growth as it will lead to the discovery of more innovative products and production technologies in the coming years. Government initiatives such as the European Commission’s investment of USD 1.3 billion in the products research & development will also contribute to the market growth. Private companies in the specialty chemicals, steel, consumer electronics, energy, etc. are focusing on R&D investments to take advantage of the product. There are over 2200 and 1750 patents on the product by Chinese and American entities respectively. These trends have led to the discovery of product based sensors, transistors, conductive films etc. and will drive the global graphene market during the forecast spell. 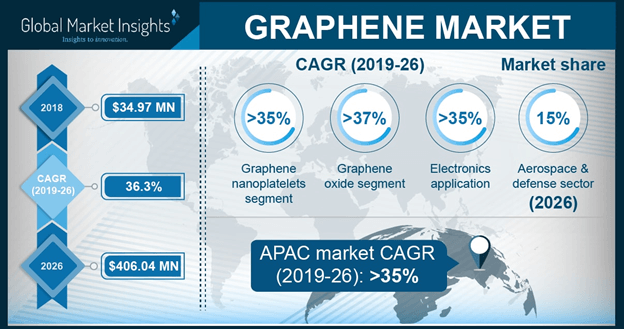 High manufacturing cost of the product is likely to hamper the graphene market growth in the forecast period as it will restrict the entry of new players. Commercialization of the product has been hindered by highly complex and expensive manufacturing processes. Synthesizing large quantities of quality product by different processes at an affordable cost has been the major challenge faced by manufacturers in the graphene market. The manufacturing process can be broadly classified into bottom up process and top down process and both processes are highly complicated and expensive. Conventional manufacturing methods involve the use of toxic chemicals, which result in the release of hazardous wastes and poisonous gases. Environmental protection and additional costs incurred for recycling/treating waste may hinder the global market growth during the forecast period as industry participants could look for other safer alternatives of the product. The global graphene market is divided into four major product segments including graphene oxide, graphene nanoplatelets, mono-layer & bi-layer graphene, and other products such as few-layer graphene and multi-layer graphene. Graphene nanoplatelets is a major product segment which accounted for more than 30% of the overall industry in 2016. Graphene nanoplatelets exhibit multiple properties such as high electrical and thermal conductivity, stiffness and surface hardness. Graphene is therefore used in various end-user industries such as energy transportation, electronics, aerospace & defense, biomedical, etc. Growing popularity in consumer electronics could be a major factor for the product in coming years. Mono-layer & bi-layer graphene product segment of the global graphene market registered a revenue of more than USD 2.4 million in 2016 and is expected to gain by a CAGR of 34.3%. Mono-layer graphene can be used as atomic scaffolding to create other materials by interposing the product layers with other compounds. Columbia University researchers have been able to create mono-layer graphene filters of 5 nanometer pore size. Bi-layer graphene material functions like a semiconductor and are used in sensors where it provides high sensitivity, good repeatability, fast response and stable specificity. Increasing research & development on this product segment will enhance its applicability in various sectors which will propel the global market during the forecast period. Global graphene market is divided into six end-user segments including electronics, automotive, aerospace & defense, healthcare, energy, and others such as coating inks, water filtrations, etc. Electronics was the most significant end-user segment and accounted for more than 30% of the overall graphene market in 2016. The product is widely used in the electronics sector due to its high conductivity and strength. They are employed in touch screens of mobiles and tablets, in making computer circuitry, and as a semiconductor. Graphene is also used in developing mobile phone memory chips. High growth of the electronics sector in Asia Pacific will boost the product demand in this region and will propel the global market till 2024. Automotive end-user segment accounted for almost 20% of the global graphene market in 2016. This segment will likely grow with a CAGR of more than 34% during the forecast period. The product is used to manufacture nanocomposites for sensors, smart adhesives, and other automobile components. Companies are focusing on developing light-weight vehicles which need lesser amounts of fuel to run. This will augment the global graphene industry in the coming years as composites made from the product will be extensively used in manufacturing light-weight automobiles. Asia Pacific graphene market registered a revenue of USD 3.9 million in 2016 and is expected to gain by more than 34% CAGR during the forecast spell. High growth in the Asia Pacific electronics industry and rising demand for automobiles in the region will drive the market growth in Asia Pacific. The presence of large graphite mines in China coupled with significant ongoing research on the product in Japan, China, India, and South Korea will also contribute to the regional markets growth. Europe graphene market accounted for more than 25% of the overall global industry in 2016. Large-scale R&D investments on the product in Europe will positively influence the regional markets growth. Flourishing end-user industries such as aerospace & defense, energy, and healthcare will increase the product demand in coming years and will fuel the market growth in Europe. The global graphene industry is significantly fragmented due to the presence of many companies that manufacture the product. The top players in the industry include Applied Graphene Materials plc, Graphenea S.A., XG Sciences, Inc., Grafoid Inc., and Graphene Frontiers LLC. Other important players in the global graphene market are ACS Materials LLC, Haydale Limited, Advanced Graphene Products, Applied Nanotech, Inc., Nanjing XFNANO Materials Tech Co., Ltd, Angstron Materials, Inc., Graphene Laboratories, Inc., Thomas Swan & Co., Xiamen Knano Graphene Technology Corporation Limited, and AMO Gmbh. Majority of the industry players are trying to solidify their market positions through mergers & acquisitions and expanding their product portfolios. There is also a significant scope for new players to enter the market. Increased competition among industry participants to obtain the majority of patents for the products application will fuel the rivalry in the global graphene market. Graphene is a tightly packed thin layer of carbon atoms bonded in a hexagonal lattice. Since its discovery, extensive research has been conducted on the product and its applications in various industries such as automotive, aerospace, defense, electronics, etc. Governments and private companies are investing heavily on enhancing the products features and simplifying the production process. The product will have extensive applications in various fields in the future due to its many advantageous characteristics. High growth in the electronics industry in Asia Pacific will increase the product demand and will boost the global graphene market growth from 2016 to 2024.